Romantic Suppers - How Much Salt? There are two types of salt, mass produced type that we find in a salt pot on the table of any burger shop, this has been processed and can contain anti-caking agents and even forms of sugar. Then there is what we will call sea salt, in most cases it has only been cleaned of dirt and has a slight colour to it caused by the dozens of natural trace minerals it contains, it’s also not ground to a powder and looks a bit like uncut diamonds. Some people say that it has an almost sweat taste compared to other salts. In our kitchen we need both the first to season things we are cooking and the second for the table. Other than seasoning we also use it to draw the fats out of meat it makes bacon and the skin of a roast chicken go crispy. So how much salt do we use? 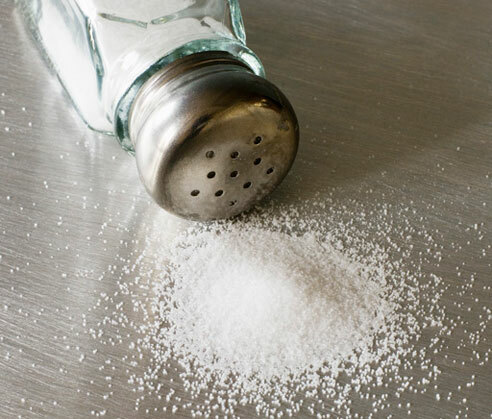 Salt has been around since the beginning of time and we still can't agree on how much to use. We are told rightly so that too much is bad for us, it hardens our arteries and is not good for our heart. Now i am sure that there are a lot of chefs out there that will tell you there are many ways to make food taste fantastic but the fact is that if you want you food to jump off the plate and kick your guest in the taste buds then there is nothing that’s going to give you more bang for your buck! However getting the amount right does take a little practice and some trial and error but the trick is to get as much of it into the food as you can without being able to taste it. So at every stage of preparation taste and add some, then taste again! doing it this way if you over do it in one stage you can add less at the next. I know that you will end up with more that the recommended amount but we are not going to cook like this every day and as the song says “A little bit of what you fancy does you good”. I never use enough so in most cases i ask my guest as to what she thinks, it a way of getting her involved and if you end up with too much then the responsibility is shared The last tip is to only sprinkle the salt using your fingers and not from a shaker it will give you a better understanding of how much salt you are using.